This dissertation is an interpretive case study that examines alcohol use by a specific subculture of undergraduates, a college fraternity. Based on nearly three years of investigation using interviews, observation, and document analysis, this study takes a detailed look at the organization's indoctrination process and the ways that their practices are explained by its most astute observers, specifically high-status insiders. Various elements of the author's biography are integrated into the text and used to enhance understanding of the phenomenon under investigation. The multiple purposes of this research were to offer a thick description of college student drinking practices, to describe and understand the organization's socialization processes, and, ultimately, to present an analysis of the group using contemporary organizational theory. This work focused on the way that a social fraternity communicates to its newest members the ways of the world with respect to alcohol consumption and its concomitant attitudes, beliefs and behaviors-and what this means in terms of the way the organization functions. 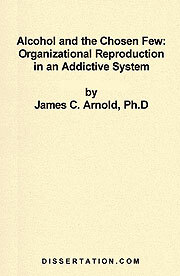 A theoretical model of organizations as addictive systems is refined in this study and used as a basis for understanding the organizational dynamics. Implications of this study for institutional and extra-institutional agents who must work with college fraternities are also discussed.